VICE President Kembo Mohadi who was injured in a bomb blast at White City Stadium last month is recovering and undergoing physiotherapy in a South African hospital. VP Mohadi was among 49 victims who were injured during the “terrorist attack”, two of whom later died. 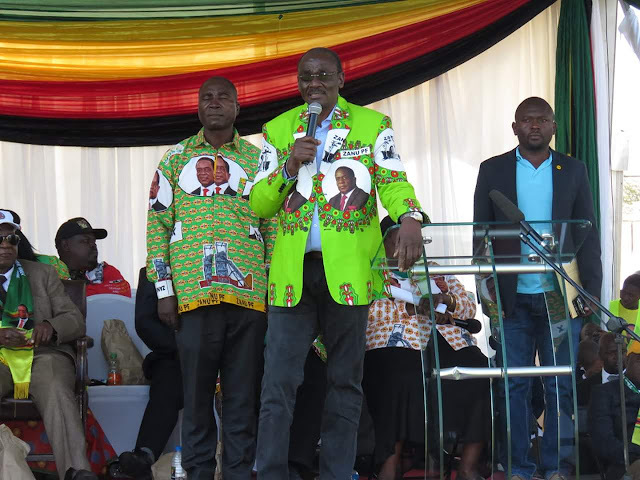 Addressing Zanu-PF supporters at Dingumuzi Stadium on Thursday, VP Chiwenga said VP Mohadi was in hospital but was recovering while Zanu-PF provincial chairperson Cde Oppah Muchinguri-Kashiri was recovering at home after treatment in South Africa. “We all know the tragedy that occurred on June 23 in Bulawayo. These attackers wanted to kill the leadership, to destroy Zanu-PF. They wanted to destroy the leadership of the Government of Zimbabwe. But they ended up injuring 49 innocent people and we have lost two of them. In that process our Vice President, Cde Kembo Mohadi, and our national chairperson, Cde Oppah Muchinguri-Kashiri, were injured,” said VP Chiwenga. VP Chiwenga said after the misfortune, VP Mohadi’s brother was also hospitalised and later died. “Why were these attackers paining people like this? What was their intention? What they wanted to achieve does not stop the election. It won’t deter us as bombs were our food when we were in the bush together with Cde SK Moyo. It will not stop the elections; instead it encourages you and the party and everyone who loves the country to work going forward,” said VP Chiwenga. He urged party supporters to remain united to shame the detractors. Meanwhile, VP Mohadi’s brother, Steven who has been declared liberation war hero, will be buried at his rural home in Mtetengwe, Beitbridge, today. Cde Mohadi (58), a war veteran and a former Zimbabwe National Army officer, died on Saturday at Trauma Centre Hospital in Borrowdale, Harare, after some illness. He is survived by his wife Emma, six children and five grandchildren. Meanwhile, President Mnangagwa this week paid a visit to the late Steven Mohadi’s home in Greendale, Harare, to pay his respects. The Head of State and Government and Commander-in-Chief of the Zimbabwe Defence Forces consoled the family, encouraging them to be strong during their time of bereavement. “I know you are going through a difficult time where you lost a family member at a time when VP Mohadi is in hospital. “Some members are looking after VP Mohadi in South Africa while others are attending the funeral here. You have to be strong during these trying times. As comrades, we console each other. We assist each other in times of trouble. “Therefore, we have offered to assist the family during the funeral and burial of Cde Mohadi,” he said. He also offered to assist the family left behind. President Mnangagwa encouraged the gathering to work hard and to live exemplary lives.